Tag line: "His life is fantastic... his wife is fantastic... his neighbors, not so fantastic"
Fantastic Mr. Fox is a delightful rarity; a kid-friendly animated adventure that is unlike any movie director Wes Anderson ever made before, yet still bears the unmistakable markings of a Wes Anderson film. After learning that his beloved wife (voiced by Meryl Streep) is pregnant, Mr. Fox (George Clooney), a notorious chicken thief, vows to find a new line of work. Several years pass. Mr. Fox is now a well-respected (if somewhat obscure) newspaper columnist, and his young son Ash (Jason Schwartzman) is proving to be a handful (along with being a bit odd, Ash seldom does what he’s told). When informed that his nephew Kristofferson (Eric Chase Anderson) will be coming to stay with them for a while, Mr. Fox decides to move his family into a bigger, above-ground home, one that overlooks three prestigious poultry farms owned and operated by Boggis (Robin Hurlstone), Bunce (Hugo Guinness), and Bean (Michael Gambon). Itching to return to his life of crime, Mr. Fox teams up with his new handyman Kylie the Possum (Wallace Wolodarsky) and raids the trio of farms adjacent to his property. But Boggis, Bunce, and especially Bean are not to be trifled with, and the three join forces in an attempt to rid themselves of a very pesky Fox. 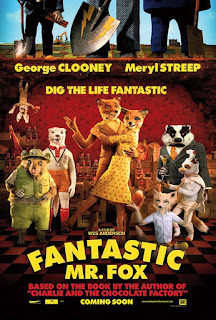 Based on a children’s book by Roald Dahl, Fantastic Mr. Fox is a movie that the entire family can enjoy, with a colorful lead character (handled wonderfully by the always-reliable George Clooney) whose various adventures will have you laughing from the edge of your seat. Along with being both funny and exciting, Fantastic Mr. Fox is also touching in its own way (the relationship between Mr. Fox and his son Ash offers a few heartwarming moments). In addition to its thematic elements, the stop-motion animation is superb, and there are scenes within the film that are truly unforgettable (the best of which features an underground feast that’s interrupted by a tidal wave of apple cider). 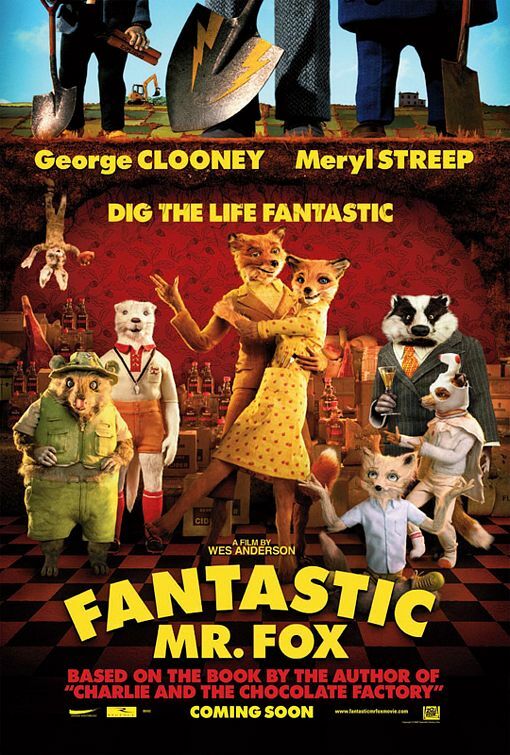 Yet as good a piece of family entertainment as this movie is, what struck me while I was watching Fantastic Mr. Fox was how Wes Anderson’s signature style shined through in just about every scene. We see it in an early flashback, when the Foxes break into a Squab farm moments before Mrs. Fox announces that she’s pregnant. Following the two as they sneak around the farm, the scene has a familiar energy to it, fueled in part by Anderson’s choice of music ("Heroes & Villains" by the Beach Boys, which plays during the entire sequence). We’ve seen stylized moments like this before in Bottle Rocket, Rushmore, and The Royal Tenenbaums, and because of this we recognize the “Anderson touch” almost immediately. In addition, many of the director’s regulars lend their voices to the movie, including Jason Schwartzman, Bill Murray (as Badger, Mr. Fox’s accountant), Willem Dafoe (as a rat hired to guard Bean’s valuable supply of apple cider), and Michael Gambon. We’re even treated to one of Anderson’s patented montage sequences (narrated by Bill Murray) in which we’re introduced to the film’s three evil farmers. Fantastic Mr. Fox is a unique entry in Anderson’s filmography, but there’s no mistaking that it is, indeed, a Wes Anderson picture.